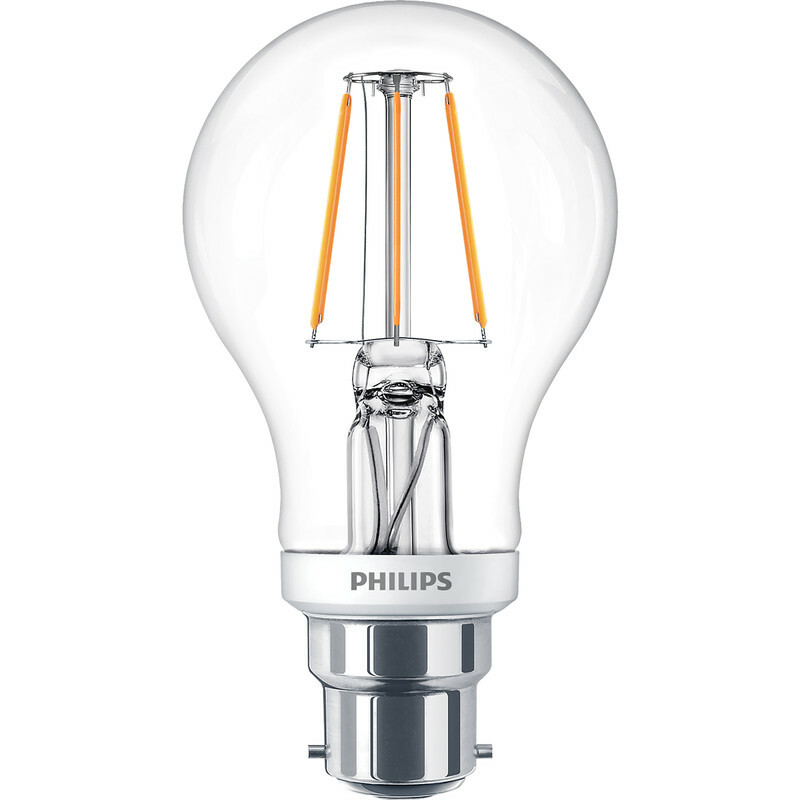 Philips LED Filament A Shape Dimmable Lamp 5W BC (B22d) 470lm is rated 4.7 out of 5 by 3. Rated 4 out of 5 by andy1547 from Flickering varies bulb to bulb when on a dimmer I recently bought a high quality LED dimmer switch (VARILIGHT TRAILING EDGE PUSH DIMMER 1G 1/2W 300W/VA). The advantage of this dimmer is it has no LED minimum load, making it perfect to install a single 7.5W bulb on a ceiling pendant. After playing around with various dimmable LEDs it was apparent how much they varied bulb to bulb. I was originally using LAP "dimmable" LEDs but they had a poor dimming range 80-100% brightness and would flicker when cold started for a few seconds (the cold start flicker varied between severe and minor bulb to bulb). I used all the configuration options available in the Varilight dimmer settings but had no luck in removing this issue. After doing some reading Philips seemed to be the highest rated for LED dimmable bulbs. I fitted two of these and they worked flawlessly, no flicker on cold start and a dimmable range of 0-100% brightness. The colour temperature would also change when dimmed unlikely other bulbs. Unfortunately when fitting the third I noticed flickering when in the 65%-100% brightness range. I took it back for a replacement and the second bulb had the same issue! Luckily the next replacement was fine, thank you ToolStation for making returns so easy! I made sure to do all my testing on the same dimmer switch in the same fitting, it seems strange that LED bulbs vary so much, perhaps they don't get dimmable tested?